Earlier this week, the Spurs, who were in Los Angeles for their first round series against the Clippers, moved from a beachfront hotel in Santa Monica (after Game 1), to the Ritz-Carlton, Los Angeles, located next to Staples Center. Wednesday, just before the Spurs left for morning shootaround, a number of big players stopped to sign autographs, including star point guard Tony Parker. 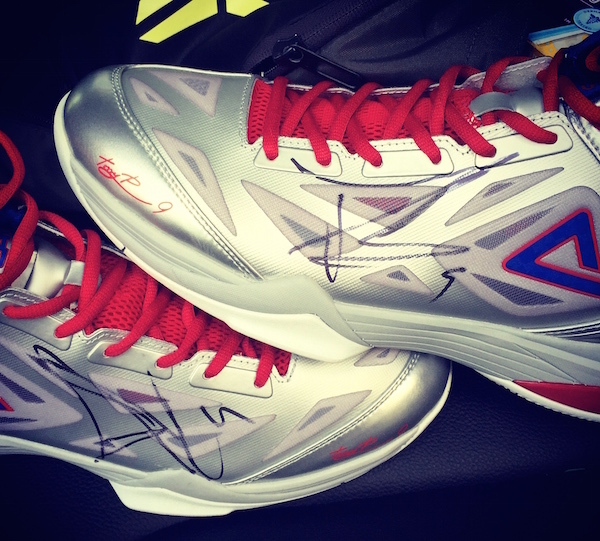 Above is a fan submitted photo of Parker's signature, written on a pair of PEAK Tony Parker Signature TP9 shoes. In addition, here is iFolloSports.com original video of the five-time NBA champs, arriving back from shootaround, a couple hours after the autograph was obtained.